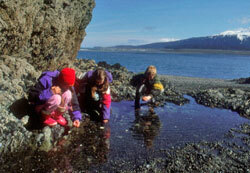 Miles of rocky beaches, big tides, and waters that teem with marine life all make Alaska a great place to go tidepooling. In Southeast Alaska alone, scientists have counted at least 170 species of macroscopic (able to be seen with the naked eye) invertebrates in the intertidal zones, and doubtless many more exist. Wander down to the beach at low tide and you’ll find prolific and diverse communities of marine invertebrates living in four distinct tidal zones. The highest point on the beach is called the splash zone, where you’ll step through a tangled patch of wave-strewn logs, dead seaweed, and other flotsam to reach the next area, the high tide zone. A few hard-shelled creatures live here, like barnacles and limpets. 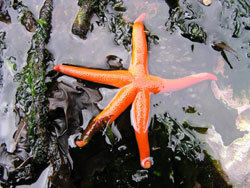 Further out, in the mid-tide zone, you’ll find anemones, hermit crabs, and a few sea stars. These are also found in the low intertidal zone, along with other bottom dwellers like nudibranchs, sponges, and sea cucumbers. You’ll only see this lowest stretch of the ocean floor about twice a month, however, at extreme low tides. Southeast Alaska and Southcentral Alaska (lower Cook Inlet, Prince William Sound, Resurrection Bay, Kodiak, Alaska Peninsula, and the Aleutians) are the best places to find intertidal invertebrates. Look for rocky beaches with cobbles, boulders and perched pools, which provide the best protection for invertebrates. The south side of Kachemak Bay has good tidepooling, as well as the beach below Bluff Point (west of Homer) at extreme low tides. If you want to know what a lugworm looks like, how gumboot chitons reproduce, which clams can weigh up to ten pounds, or what predator is the Sitka periwinkle’s worst nightmare, you’ll find these answers and more in our invertebrate species profiles. Your tidepool experience can be affected by many factors including the salinity of the water, the amount of freshwater runoff and glacial silt muddying the waters, and the height of the tides. To check on tides, pick up a tidebook at any sporting goods store or look online at the state Office of Boating Safety. Finally, before you head to the beach, please review our tips under “Tidepool Etiquette” and our requirements for “Collecting and Harvesting.” Unless you are a scientist or an educator with a permit, it is illegal to collect marine invertebrates that you don’t plan to eat.